It Was Always More Than Just an Email - who is nicka smith? It all started with one email. Then, just as a balanced discussion was finally beginning to happen, another one arrived. Edited to add: The cousin referenced in the blog post below and a previous one removed the kits in question from GEDMatch upon receiving the initial email. They also did not respond to the contact. The researcher discussed contacted them after the initial non-response and GEDMatch kit removal. Then, another email was sent. Many picked up on the fact that the first email could have been perceived as a scam since the researcher didn’t mention who they worked for or have some form of law enforcement validation attached like an email address issued by an official agency or official letterhead from the agency. In this second email, the researcher lists the company that they worked for, which I chose to redact, although I did leave a breadcrumb behind for those who are interested. Some folks called me “melodramatic” and said that the first email was nothing to be concerned about. Others said if another came, it would be harassment. Well, what do those folks have to say now? Since I have time today, I’m going to present some more things for our community to consider. Folks who operate in criminal circles often enact retribution on those who implicate them in crimes, so what type of security was the researcher going to offer my cousin if they provided the information? My cousin AND her family’s safety could be in jeopardy behind sharing this information and not just at the hands of the suspect, but potentially others. This is not the “Can you help identify my father. I’m an adoptee” sort of ask we usually see. This is “Can you give me your years of genealogy research because I’ve clearly hit a roadblock, help me identify an alleged criminal in said genealogy, and maintain your silence about it all while you help so that they – or their associates – don’t kill you?” HUGE heaping difference. The assumption regarding relationships is really not OK. I cannot speak on other communities, but I know too many folks to count who are people of color who are familiar with and have great relationships with family beyond their first and second cousins. Many of us have been having family reunions for more than half a century, sometimes longer, with extended family. Making the assumption that my cousin, and her family, don’t know the alleged criminal personally is beyond a reach and would sit wrong with a lot of people. Additionally, in my first post, I spoke briefly on the history of people of color and law enforcement. This researcher should know they are dealing with two groups who have a challenging history where one side may be distrustful of any communication received from the other. Both emails don’t take this into account and assume that my cousin, and her family, would naturally trust what the researcher is saying without question. Proper diversity training could have rectified this. In episode 58 of BlackProGen LIVE, we discussed different case scenarios that presented unsettling information while doing DNA research. One of the scenarios we covered at 44:09 was one where someone uploaded their niece’s data to GedMatch and got a questionable result. During the same discussion (17:58), panelist Shelley Murphy touched on a huge error she encountered within her own immediate family when she accessed GEDMatch. The analysis and comparison results presented on this Site are provided ‘as is’ and no representations are made regarding their accuracy or usability. Changes in software and analysis tools may be made from time to time that could change results from those previously provided. We do not make any promises about: (a) the functionality of the Site or the Site tools; or (b) the quality, accuracy, reliability, or availability of the Site, including about any personal information, Raw Data, or Genealogical Data provided to the Site. Any reliance you place on information found at the Site is strictly at your own risk. We disclaim all liability and responsibility arising from any reliance placed on such information by you and any other visitor to the Site, and by anyone who may be informed of any of its contents. The operators of this Site are not responsible for the consequences of using the information provided on this Site. Considering the discussion just our small group had, and considering what the terms of service note, aren’t folks who are focusing on this line of work making a big gamble as to the accuracy of their findings if the service they’re using to identify criminals won’t even guarantee the information it provides? Further, none of the big genetic genealogy companies will release information on their customers to law enforcement without a warrant, yet GEDMatch seems to happily pass the information on, accuracy not guaranteed, without a warrant. If an error happens – with a kit where researchers believe they’ve confirmed the right person as the suspect – should we just hope and trust that additional checks and balances are in place before arrests are made? Would law enforcement defer to the genetic genealogist instead of checking their work? When are genetics experts brought in, early on or only during a criminal trial? The later it is the more likely a person’s life would be crushed due to the allegations raised. Again, I bring up The Innocence Project. There would be no need for it if everyone was protected equally during investigations. 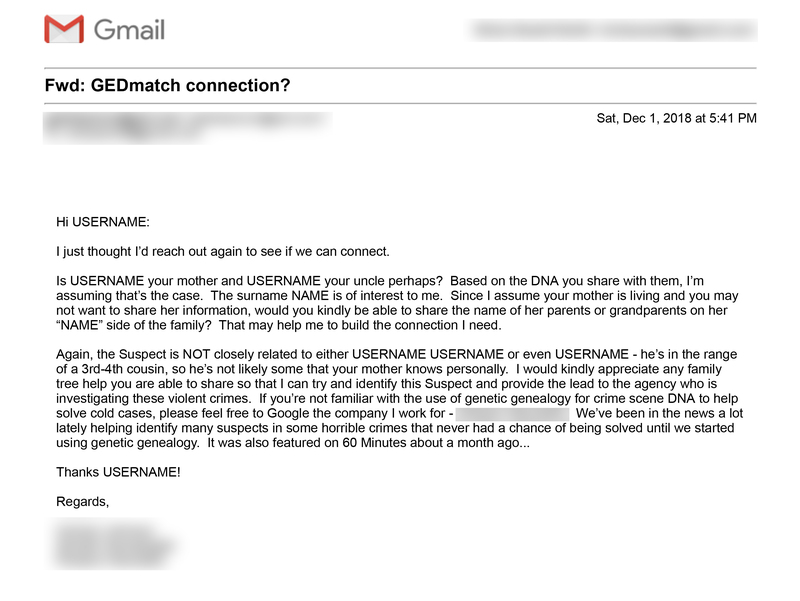 Many have said that some of the concerns that have been raised have inadvertently segregated GEDMatch’s system. I can’t say that I disagree with that at all. It likely has been an unintended consequence. We’re all also failing to discuss is how this entire change in practice skews the thread of goodwill which is the bedrock of the genealogical community. Most of us naturally want to help each other unearth the identities of our ancestors in a quest for better self-knowledge. On the other hand, the natural benevolence expressed for decades appears to have been repurposed in a way that will have some gaining and others potentially paying a painful price. ALL should read that to include African Americans as well since studies show on average we are 25% European. (2) Murphy, Heather. “Most White Americans’ DNA Can Be Identified Through Genealogy Databases.” The New York Times, 11 Oct. 2018, http://www.nytimes.com/2018/10/11/science/science-genetic-genealogy-study.html. Accessed 3 Dec. 2018. You have initiated an important conversation about the use of DNA evidence by genealogists. Guidance is provided by recent revisions by the Board for Certification of Genealogists to the Genealogist’s Code of Ethics, to protect people who provide DNA samples. The revisions include requirements to explain risks and consequences and how other researchers could or could not access data. Nicka thank you for both posts and I agree. I actually deleted all my kits when the first case came out. I uploaded them and marked them as research only so that they cannot be seen or found. I still have full access to the tools including the one to many. It just have my privacy set to not share.